The Medical World News Collection is one of the largest and most interesting in the McGovern Historical Center. Comprised of over 80,000 photographic prints, slides, and negatives, it offers an expansive visual tour of medical advances from 1960-1994. For most, if not all, of the images in the collection, we have the best caption of all – a full-text article! The collection also includes bound volumes of Medical World News issues, and each photograph indicates the article title and date of publication. Gina Leonard, our Archives Assistant, is busy rehousing and labeling the collection, and she has come across several images that have piqued her interest. We feel that you too will enjoy what she’s found and the stories behind the images. Below is image #6628 followed by the article, “Operation Ends Equality for Siamese Twins.” The article title, date, and page number were identified on the back of the print. With that information, we located the article that details the complications during the separation surgery of 2-month-old twin sisters, Chandra and Charron. 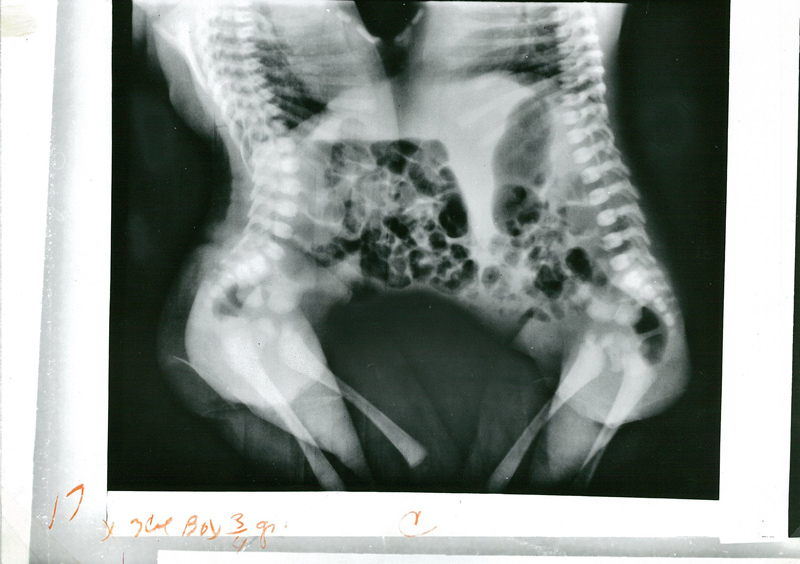 Suddenly, this image becomes more than just an x-ray of conjoined twins. It’s a great example of the power of stories behind images. Can’t wait to bring you more as we process this collection! 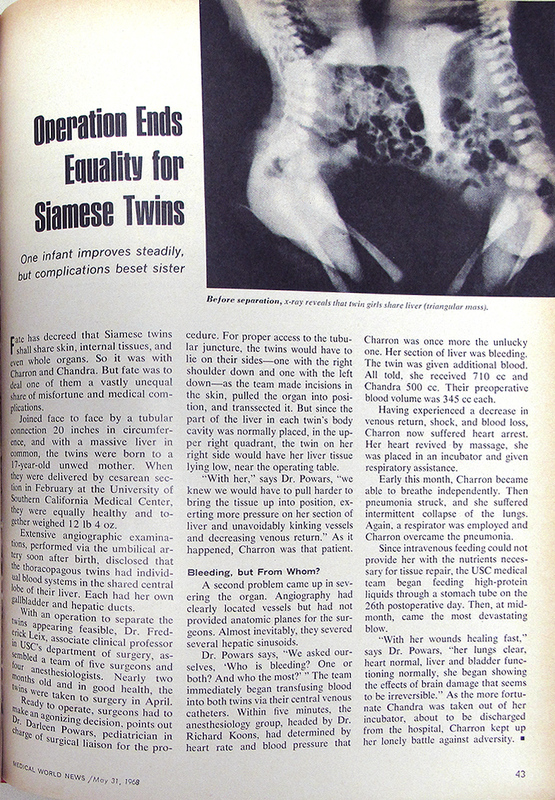 “Operation Ends Equality for Siamese Twins,” an article in the May 31, 1968 issue of Medical World News. Medical World News Collection, McGovern Historical Collection, IC077, 5/31/1968.